I’ve already extolled the virtues of mapo tofu in the recent past, but did you know that there are variations on mapo tofu? Although my favorite will always be the classic mapo tofu, the version made with eggplant, called mapo nasu, is seriously delicious! 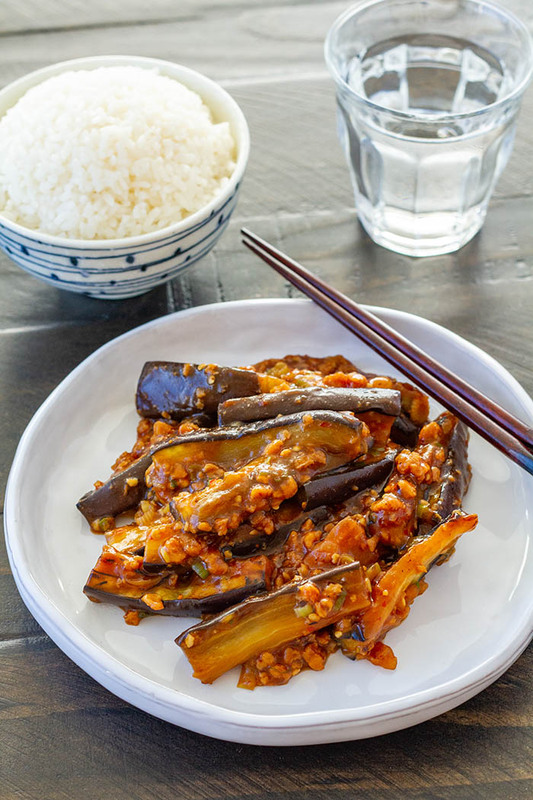 Eggplant replaces the tofu in this version of the Japanified Chinese stir-fry dish. 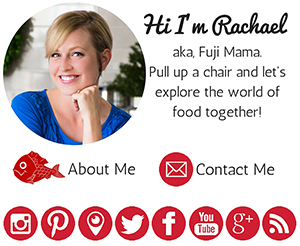 It’s the best made with Japanese or Chinese eggplant varieties, which have fewer seeds, thinner skin, and milder flavor, but I wrote the recipe using the regular globe eggplant that can be found in any old American supermarket, so you don’t have any excuses to not make it—it’s still delicious! 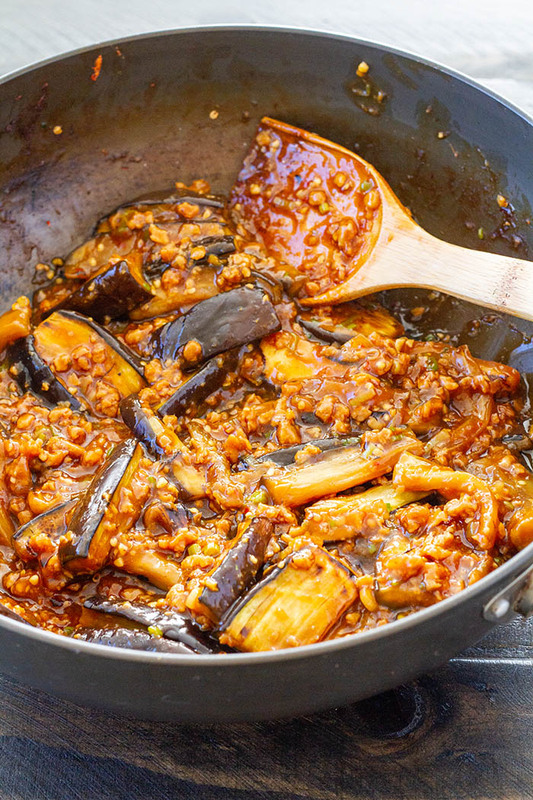 Stir-fried strips of eggplant in a garlicky “meat” sauce is pretty darn amazing. 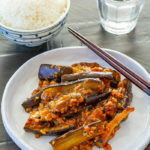 Making it with eggplant does require one additional step, since the eggplant has to be cooked first before it is added to the sauce, unlike the tofu. But we’re only talking another 10 minutes, so you still can’t use that as an excuse! 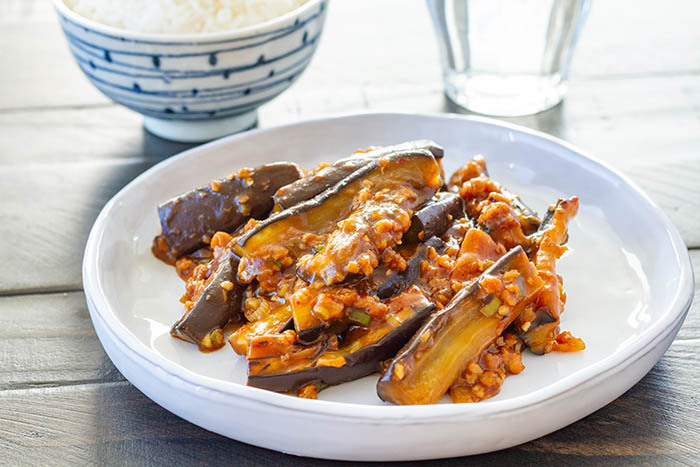 A twist on our family favorite mapo tofu (Japanese tofu in a garlicky "meat" sauce), made with strips of eggplant in place of tofu. Trim off the stem end of the eggplant and quarter the eggplant lengthwise. Slice the long spears of eggplant into finger-lengths. Saute the pieces of eggplant in a large dry skillet, turning the pieces occasionally, until they start to brown. 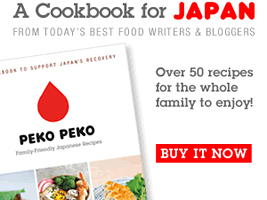 (Could also use a bit of sesame oil in the pan if you would like, but it's not necessary.) 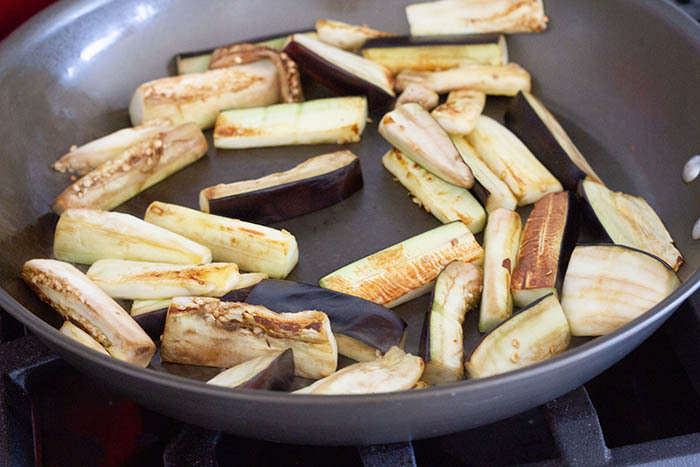 Remove the pan from the heat and set the eggplant aside. 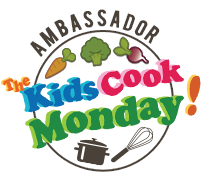 Once the mixture comes to a boil, add the eggplant and gently stir it so that it becomes coated in the sauce.